Dean Albert Comer to Library Staff today: The “getting books back to their home” project, which involved creating a project plan, moving 25,000 books to the lower level, putting the books back in call number order, replacing the shelving on the second floor, and moving the books back to the second level, is completed. This project involved many people from across the library. Everyone helped by either sorting/moving/shelving or staffing areas. Alberta sends a sincere thank you to all. This was a large task and the library staff carried it off magnificently. C-SPAN 2. (Channel 65 on Terre Haute’s Time Warner Cable. We are VERY EXCITED about this event. Many of us attended the July 21 taping. But even more, Kyle, an ISU alumnus, conducted much of the research for both of his books [see below] using the Floyd and Walker Family’s collections of 19th Century Textbooks in Cunningham Memorial Library’s Special Collections Department. History in the Making: An Absorbing Look at How American History Has Changed in the Telling over the Last 200 Years. Print Makes A Comeback In 2011 Says Marketing Guru. You Agree? Has The Digital Era Made Publishers Defunct? New eBook Textbooks: School Still Boring? August 26 marks the 90th anniversary of the ratification of the 19th amendment, giving women the right to vote. The Women’s Studies Program and Interdisciplinary Programs invites everyone to attend a celebration of this event on Thursday, beginning at 4pm in the Library’s Events area. This program and reception will also celebrate the 2010 Awardees of the Charlotte Zietlow Women Faculty Research Grant. Dr. Zietlow, recognizing the gender gap in tenure, determined to do something about it, and created the endowment that funds grants to support pre-tenure women faculty. For more information about this grant (application process for the next round will be Spring 2011), please visit http://www.indstate.edu/wmnstudy/awards.htm. Following the reception, consider staying on for a showing of a powerful movie, Iron-Jawed Angels, 6:15-8pm. Please urge your students to attend this film. Starring Hilary Swank as Alice Paul and Angelica Houston as Carrie Chapman Catt, this 2004 film forcefully portrays how many women put their lives at risk to give women what is now often taken for granted: the right to vote. Students are also welcome to attend the Women’s Equality Day/Zietlow function! Friday night, August 20, we opened especially, from 8pm until midnight to hold: Wii Welcome You to the Library. More than 500 students came for gaming, music, dancing, some popcorn and lemonade. This year’s venue was the year-old Student Recreation Center. Following a lunch of hot dogs, chips, water and desserts, the ISU Marching Sycamores played and sang, the Sparkettes sparkled, and other festivities took place, including a series of silly games with teams from the different Deans. Dean Alberta Comer does her bit for the Academic Affairs team event. Reference/Instruction Librarian Marsha Miller (right) won the Show Your School Spirit award – ok, there were only 3 contestants. She received a Barnes and Noble gift certificate. The Library and Root Hall’s Writing Centers are closed until 9:00 a.m. Tuesday, September 7. Writing Center Coordinator, Darla Crist, has left ISU for a position at Ivy Tech. Barb Austin, Library Instruction Scheduler, is currently coordinating day-to-day routines at the ISU Library location. Getting 25,000 Books Ready to Re-shelve ASAP! 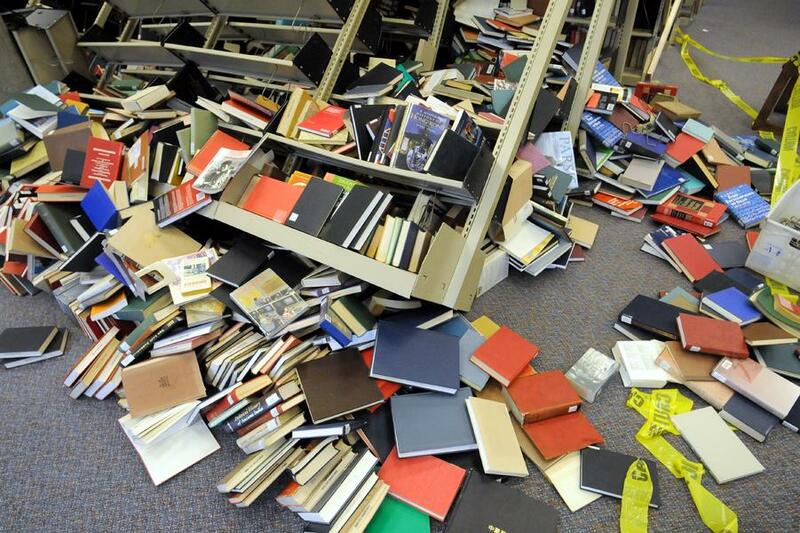 Remember those 25,000 books that were knocked off the shelves during ‘the incident’ on August 4? For the Terre Haute Tribune Star’s article, see http://tribstar.com/local/x2064740993/Domino-effect-Tipping-shelves-send-25-000-books-onto-floor-at-ISU-s-main-library.